A team of UK astronomers have announced the discovery that some supernovae have bad habits -- they belch out huge quantities of 'smoke' known as cosmic dust. This solves a mystery more than 10 billion years in the making. The new observations, published on 17th July in the journal 'Nature', answer long-standing questions about the origin of the first solid particles ever to form in the Universe. The "Cassiopeia A" supernova remnant as seen by SCUBA, revealing a shell of cosmic dust about 12 light years across. This is an image taken with submillimetre wavelengths of light. The black and dark blue colours represent fainter emission, whilst the light blue and white areas shine the brightest. Credit: Loretta Dunne (Cardiff University) et al. The team measured the cold cosmic dust in 'Cassiopeia A', the remnant of a supernova explosion in our own Galaxy, about 11,000 light years from Earth. The amount of dust was a thousand times what had been previously detected, suggesting that these powerful explosions are one of the most efficient ways to create cosmic dust. This also answers the riddle of how large quantities of dust recently discovered in the early universe were formed. Unlike household dust, cosmic 'dust' actually consists of tiny solid grains (mostly carbon and silicates) floating around in interstellar space, with similar sizes to the particles in cigarette smoke. The presence of dust grains around young stars helps them to form and they are also the building blocks of planets. Dr. Loretta Dunne from Cardiff University, who led the research says "Effectively, we live on a very large collection of cosmic dust grains! The question of the origin of cosmic dust is in fact that of the origin of our planet and others." Supernovae are the violent explosions of stars at the ends of their lives. In a single instant, a supernova can release more energy than our Sun will produce in its entire nine billion year lifetime. They also make large amounts of heavy elements like carbon and oxygen and throw them out into interstellar space. Since these are the ingredients of cosmic dust grains, it was suspected that supernovae might be important in explaining the origin of dust. However, until now, only tiny amounts of dust had ever been found in supernovae - leaving astronomers with a smoking gun, but not enough smoke. Haley Morgan, a Ph.D. student at Cardiff University, explains "Some supernovae are the violent ends of stars that live fast and die young. These stars are many times the mass of our own Sun, and they burn their fuel thousands of times faster, in only a few million years. If supernovae were efficient dust 'factories' they would each be producing more than the mass of the Sun in dust." The team looked at 'Cassiopeia A', the 300 year-old supernova remnant created when a star about 30 times more massive than the Sun exploded. The material from the explosion is still travelling outwards at speeds of 10,000 km per second, sweeping up the surrounding gas and dust into a blast wave shell. Dust grains block half of all the visible light from stars and galaxies, but this dusty cloud has a silver lining as they also shine this stolen starlight back out as far-infrared and submillimetre waves (at wavelengths between 0.1 and 1 millimetre). To detect these wavelengths, the team used 'SCUBA', the world's most powerful submillimetre-wave camera, attached to the James Clerk Maxwell Telescope in Hawaii. 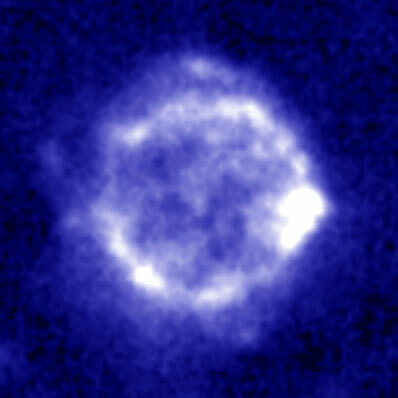 SCUBA detected a dust shell in Cassiopeia A with a total mass around 1-4 times that of the Sun. Dr. Steve Eales, also of Cardiff University, says "This is over a thousand times what's been seen before! Cassiopeia A must have been extremely efficient at creating dust from the elements available." Prof. Mike Edmunds, head of the School of Astronomy at Cardiff, adds "Astronomers have been searching for dust in supernova remnants for decades, but they could only detect the tiny fraction of dust which was relatively warm. With SCUBA we can at last see the dust which is very cold, at a temperature of -257 degrees Celsius." In recent years, SCUBA has also found distant galaxies full of dust, more than ten billion light years from Earth. The light from them has taken so long to reach us that we are seeing them as they were when the universe was only about one billion years old - less than one tenth of its current age. The origin of this ancient dust was a mystery. Astronomers had thought that dust was mostly made in the winds from cool, giant stars in the late stages of their lives. But stars such as our Sun take about nine billion years to reach this stage, so it was impossible for the dust to be created by stellar winds within the first billion years of the universe. With dust created quickly in supernovae, the mystery has been solved. Dunne says "Dust has been swept under the cosmic carpet - for years astronomers have treated it as a nuisance because of the way it hides the light from the stars. But then we found that there is dust right at the edge of the Universe in the earliest stars and galaxies, and we realised that we were ignorant of even its basic origin. Now, with these supernova dust factories, we can explain how that dust was made." Dr. Rob Ivison of the UK Astronomy Technology Centre in Edinburgh says, "Massive stars become supernovae in the blink of an eye by astronomical standards, so we can now explain why the early universe is so dusty." "These observations give us a tantalising glimpse of how the first solid particles in the universe were created." adds Haley Morgan. This work will be published in Nature, 17th July 2003, Vol. 474, p.285.